Winter has been a bit fickle so far this year. We have had all kinds of weather- snow, wind, rain, sun, more rain, and lots of cloudy days. So, this week was a perfect time to talk about weather at story time! 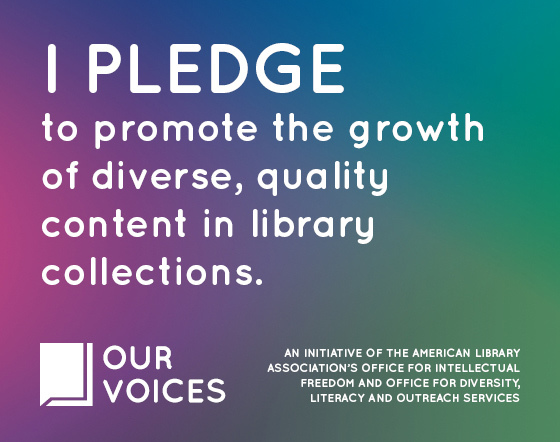 With all of the fun tricks I have discovered on other librarians’ blogs, this theme also makes a perfect choice for my new outreach program. There are so many good weather related books to choose from that I had trouble narrowing down the final list. Maisy’s Wonderful Weather Book was a must because of all of the interactive pages filled with pop ups. It’s a great starter for talking about weather and getting kids to start thinking about what’s happening in the environment around them. 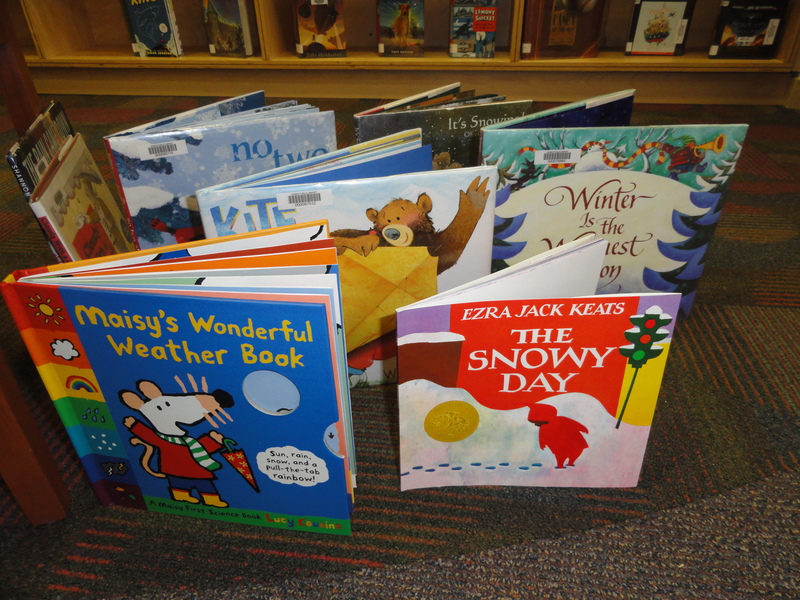 Snowy Day by Ezra Jack Keats was also a must because many of the kids receive it as part of the community supported Imagination Library program. Kite Day rounded out the three-we ran out of time after talking about the weather conditions outside, singing about the weather using the flannel board, and thinking up words that begin with the W sound. The envelope in the flannel board picture is a tool I recently started using at the beginning of each story time. It is addressed to the story time and is a hand written letter from Hector, our moose, who lives in the library and writes us letters at night. The letters include a clue about the story time theme. It’s a nice routine and gets the kids’ brains warmed up, but I will see how it goes. The kids aren’t asking for it, so I don’t know how effective it is. I read about the idea somewhere online, but I can’t seem to find the blog now. The weather flannel board templates I got from While She Naps and I used them for the cutouts for the weather craft. My flannel board pieces look more like Storytime Katie’s though and I used a song from Katie’s site to go along with it. 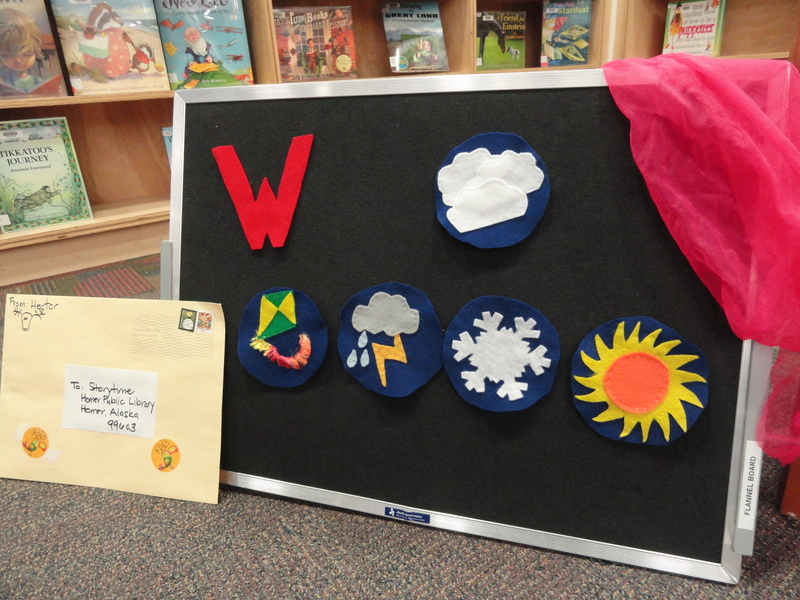 Perpetual Preschool has lots of weather songs perfect for story time. Is there rain, or is there sun? 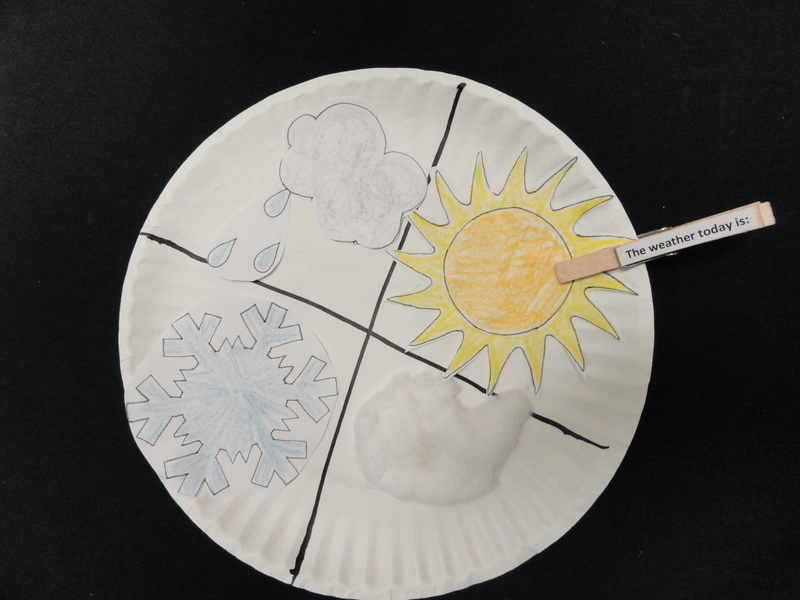 To finish off the morning, kids cut out the weather templates, colored them and glued them in one of the sections I divided up on each paper plate. I didn’t include windy, but added it after the first story time because a little one came up and asked me “Where is the spot for windy?” We quickly made a kite and found it a home. Shame on me! For my first visit in the pilot outreach program I took the flannel board, craft and books to a small group at the fire station and a group of twelve kindergarteners who are learning English as a second language. The weather was wild that morning and the group of us kept an eye on the windows to see what was coming next! The books, song, and easy-to-do craft were perfect.